So just in case you happened to miss my comments on the 2007 Neighborhood Festival that took place last September, in short, Steve Aoki blew me away. 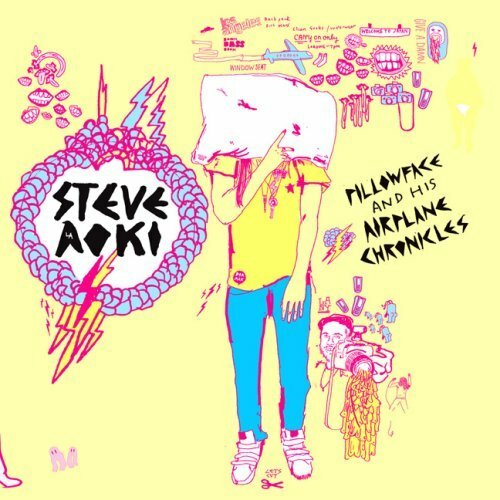 Taking into account that this man is the king of the L.A. electro scene right now and that he is the mastermind behind the Neighborhood Fest, let’s see how his new mix-album titled “Pillowface and His Airplane Chronicles” weighs in. Beginning, please find me another electro album that opens with a punk song better than this. You can’t. I say that because track #1, Refused’s “New Noise”, is and has been for quite some time my favorite punk song ever, and because I’ve never heard electro records open with anything but electro. That being said, this is an “indie/electro” album Aoki quickly on to Erol Alkan’s “Durrr Durr Durrrrrr” edit of Justice’s “Waters of Nazareth”. As for the progression of the album, the mixing of the tracks isn’t anything special. That being said, the song selection is spot on. One point that Aoki made in an interview was that while there are various talents that DJs can bring to the table, “at the end of the day, it’s the songs you want to hear… the most important part of DJing is selecting records.” Well said sir. The mood or tone of the mix fluctuates throughout, making for a solid hour of indie/electro that flows very well. Of the various remixes to be found in the mix, MSTRKRFT shows face a couple times just as Erol Alkan does. Weird Science, the production team made up of Aoki and partner-in-crime Blake Miller also pops up nicely remixing Peaches’ “Boys Wanna Be Her” and Bloc Party’s “Helicopter”. All in all, Steve Aoki and friends have made a mix album that certainly rises above the ranks of bootleg live sets. 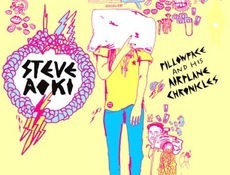 Through the many guest drop contributions and Aoki’s unearthly ability to gauge when to drop the heavy hitters and when to pull back for a bit so that fatigue doesn’t set in, “Pillowface and His Airplane Chronicles” is a solid effort that succeeds as a standalone album to be played both in the clubs and in the privacy of your home.